Our garlic harvest was pretty modest this year. Considering the neglect it had to put up with I’m surprised we got any at all, let alone harvesting more than we planted. Prepare the bed well. Don’t just turn over some sod and shove the cloves in. A fertile, friable bed that’s weed free is best. If it’s a raised bed, even better for drainage and warmth. Keep the garlic weed free. In our case the grass from the pasture came back with a vengeance, competing with the garlic for moisture and light. When it came to harvest, finding the garlic among the long grass and occasional thistle (ouch) was difficult. We might even try planting the garlic through slits in a strip of carpet – it worked well for the strawberries this year. When your Father in law helps by mowing around the gardens, be very clear about where the garlic is hidden so some of it doesn’t get an untimely haircut. Harvest in six months, more or less. 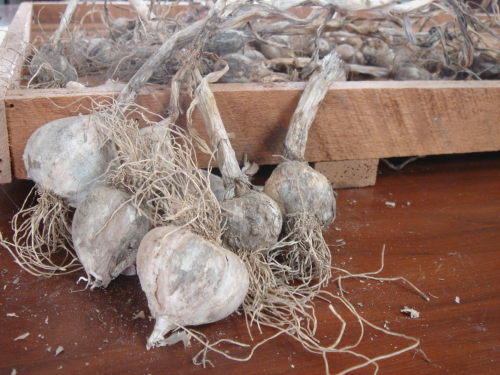 Traditionally, you plant garlic on the shortest day and harvest on the longest. It’s a good idea to dig up a couple of plants each week from 5 months onwards. That way you can tell the best time to harvest it all and you can pick a warm, dry day to dig. The less moisture on the garlic when you dig it up, the better it will dry and keep. It should stay fine in fresh air for a month or two but you can keep it longer in a brown paper bag in a cool, dark pantry. Two methods I’ve heard of but haven’t tried yet are: smoking it, or soaking peeled cloves in vinegar for a couple of days then storing the cloves in olive oil. You could probably dehydrate or freeze crushed garlic too come to think of it. A good lesson learned by me – make sure your plants get good light. My bulbs were planted in rows with gradual decrease in available light along them (part shaded by tree). Huge difference in bulb size. Rumour has it, that day length is the main contributor in bulb formation. On storage – you can also blanch peeled cloves and leave them in a jar covered with olive oil.